After someone dies and they have a will, it must pass through probate. Probate is the process where the will gets submitted to the court by the executor of the will, and then the court supervises the executor throughout the probate process. 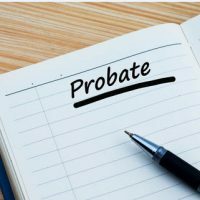 The probate process involves gathering the assets of the deceased person and paying off debts, including burial costs, and then distributing the remaining assets to the beneficiaries named in the will. Probate is an important process, but it can be long and costly. However, there are ways to get around probate that allow the assets to pass directly at death, eliminating the need for the probate process. These tools are called “will substitutes”, in that they substitute the need for a will. However, everyone’s estate is different and therefore it is important that you work with a knowledgeable estate planning attorney who can help you come up with the most appropriate will substitutes for your situation. Living trusts are one of the most common kinds of will substitutes. With a trust, the assets are not directly given from the grantor to the beneficiary, but rather they are held by a third party for a period of time for the benefit of the ultimate beneficiary. At some point there will be a triggering event, such as the death of the grantor of the beneficiary turning a certain age, that will then transfer all of the property to the beneficiary and eliminate the need for the trust. There are many kinds of trusts and they have different advantages and disadvantages depending on the situation. A “living” trust means that the trust was created during the lifetime of the grantor. Life insurance is another way to get around probate; indeed, with an insurance policy, you can name the beneficiary who will get the proceeds of the policy directly. As long as the beneficiary is not the estate itself, the money will transfer directly to the person named in the policy and there is no need for probate. Another way to avoid probate is to have accounts that designate a “payable on death” beneficiary. Similar to a life insurance policy, these accounts will transfer the money directly to the beneficiary at the death of the account holder. Finally, another common way to avoid probate is to use joint ownership with a right of survivorship. Joint ownership means that more than one person is the legal owner of the property, such as a husband and wife who own a house together. If there is a right of survivorship, at the death of the other property owner the surviving owner will own 100% of the property (assuming there are only two owners) automatically. If you are thinking about planning your estate, you should work with estate planning attorneys who can help you avoid the cost and trouble of probate. Our experienced estate planning attorneys at Millhorn Elder Law Planning Group in The Villages, Florida, can help you with all your estate planning needs.